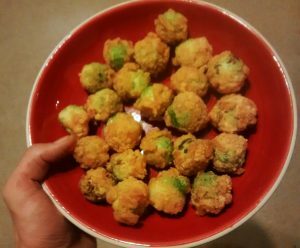 I made a large vegetable dish last night which turned out particularly well, and I’ve had a request for the recipe from one of the people who ate it. I didn’t measure anything, I’m afraid, so all the quantities are going to be pretty vague. I was feeding five, but probably made enough for seven or eight (we had it for lunch today, as well). I really should have taken a photo, but I was too busy eating. Heat oil to a medium-high temperature. Add garlic to a large frying pan or sauce pan, stir until just starting to turn brown (a minute or two). Add carrots and ginger along with some turmeric, and stir enough to keep it all from sticking. Steam, parboil or microwave broad beans (I microwaved for around three minutes with a little water, and discarded the water – I think this removed most of the bitterness from their skins). Add broad beans, courgette and red pepper to pan. Turn down to medium heat. Add a couple of splashes of vinegar. Mix the miso and mustard with a little warm water and a little vinegar to dissolve. Add kale to the pot, and stir thoroughly. Like other brassicas, kale only needs a few minutes to cook, and starts losing its flavour and gaining a sulfurous aroma after that. Turn off the heat and toss the miso mixture over the vegetables. Sometimes I get seized by a vision of something I think I could cook, that I’ve never heard of anybody else cooking but which feels to me like it could be really, really good. Every now and then it turns out that I’m wrong, and my crazy ideas don’t add up to something delicious after all. Most of the time though, I find that I am right and make something I’m really happy with, like chocolate risotto with chestnuts and pears. For once I pretty much know how much I used of each of the ingredients, because I followed the risotto essentials from the excellent mushroom risotto recipe (one of the few recipes I’ve ever actually followed as such) in The Vegetable Book , by Colin Spencer (one of my all-time favourite books). This provided a good-sized helping for three people, possibly greedy people. You could probably feed four average-sized stomachs without too much trouble. I would describe this as semi-sweet – enough so that it feels indulgent, but not insane, for this to constitute a main evening meal. Loads of cocoa. Um, about 50g maybe? 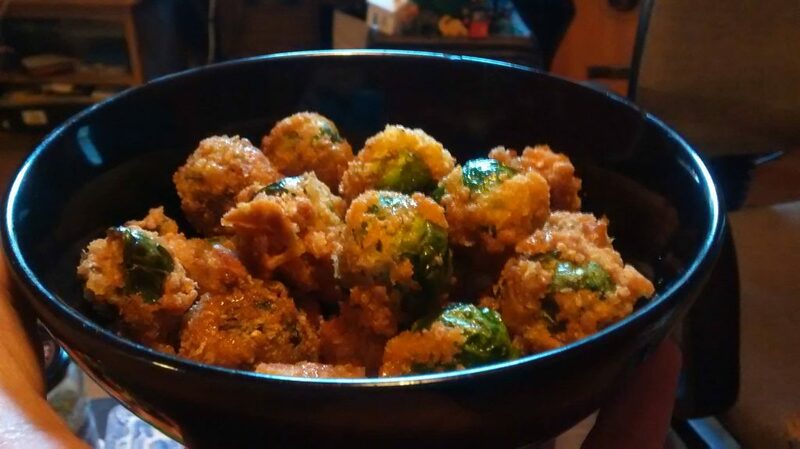 Get the chestnuts ready to go, first – I used dried chestnuts that needed boiling for 10 minutes and then draining and clearing of a few bits of brown skin. You can probably get them in tins or cook fresh ones on an open fire, whatever works for you. They need to be in small pieces, so break them or chop it up quite finely. Once they’re ready you need to chop up the pears into smallish chunks, ready to go. Melt the coconut oil and add the pears together with the chestnuts, lemon, salt and spices, then once they’ve started to soften add the rice and cocoa. Mix well, so the rice starts to take up the flavours around it, then add 1 and a quarter cups of hot water and bring to the boil. Simmer with the lid on for eight minutes, then let it stand for five. Check that the rice is well cooked – if it’s not, you might need to add a little more water and turn the heat back on for a bit. Note: Although this was off the top of my head, I’m not the first to have invented it. I’m okay with that. I finally got to try Gyokuro green tea at a beautiful little salon de thé called The Tea Caddy, in the Latin Quarter of Paris. It is never a cheap tea, but they had it for around half the price I’ve seen elsewhere. The leaves and the infusion are remarkably green, quite vividly so, and if you can imagine it, the taste is, too – quite richly vegetal, but not unpleasantly so. It is also a very characteristically Japanese flavour, with the seasidey overtones that implies. It’s not quite right to say that they’re fishy, but there’s certainly something of the ocean to Japanese green teas, which some people dislike. For my part I found the Gyokuro delicious, with a particularly deep flavour and very little bitterness to it. It stands up well to multiple brewings, at least as many as I could fit in on my visit. Gyokuro is made from tea that is shaded for the last few weeks of growing, deepening both colour and flavour, adding to the theanine and caffeine content. This is also how they make Matcha, the powdered tea used in the tea ceremony cha-no-yu, although the drying process differs. Gyokuro should be brewed with cooler water than most green teas, only 50-60°C, and far more tea per cup – two tablespoons for just a quarter-pint of tea! The taste and the rebrewability should make up for the apparent lack of economy. With thanks to O-Cha and Wikipedia for some details. Flavour perception is a deceptively complex thing. Human taste buds are capable of sensing salty, sweet, sour and bitter (the four classical elements of human taste) plus umami (the savoury taste of glutamates such as MSG, found in things like mushrooms, soy sauce and meat) and probably fat (the jury is still out on this one, but the evidence is strong). However, none of those play a central role in tasting something like most good tea or wine! Most of the flavour of the most interesting drinks comes from their aromas. Our sense of smell is easily the most elaborate of all our senses – unlike the five or so basic tastes detected by our tongues, or the three basic colours detected by our eyes, our noses are capable of distinguishing thousands of different molecules. Complicating matters further is the interaction between olfaction (the sense of smell) and gustation (the sense of taste provided by the taste buds); sometimes we won’t be aware of an aroma until we taste something with our tongues, and sometimes a particular taste becomes obvious only when we smell something associated with it. The two are bound up together so tightly that most of the time, people are not even aware that they are ‘tasting’ things with their noses, not just their tongues. For this reason it is always worthwhile to be conscious of the smell of fine teas, wines, whiskies and so on before tasting them, but also aware that the depths of their flavour cannot be judged until they reach the tongue and the palate. There’s more: Add to the gustation and olfactory components the trigeminal sensations of pain and heat triggered by both physically hot and spicy hot food; the effects of texture, known in the business as ‘mouthfeel’; and astringency – the quality of tea, red wine and some fruits which makes us pucker our mouths, regardless of how they actually taste. So, to tea: What can we say about how tea tastes, and why? For a start, the overwhelming majority of true teas are at least a little bitter, and all are astringent to a greater or lesser extent. The tiny fragments of blended black tea used to make your basic tea bag for English tea are extremely bitter, and so astringent that the infusion is almost impossible to drink straight. Thankfully though, the molecules that give it these properties bind to the proteins in milk just as readily as they will to our tongues. 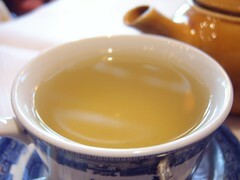 They can also be more fully dissolved into the tea by adding lemon or some other mild acid – one of the few times when adding lemon makes something much less bitter. You will also notice that strong black tea clears and brightens almost immediately when lemon is stirred in, for exactly the same reason. Lighter black teas like Darjeelings and Chinese black teas (Keemun, Yunnan and so on) tend to be much lesser bitter than their cousins, but this is largely because they are standardly brewed weaker. These teas have a depth of flavour coming from their subtle aromas, and many people feel that this goes to waste when they are made with milk, which has its own not-so-subtle smell. It might be argued, though, that a little milk is not offensive in a cup of the more robust light black teas, allowing for a stronger brew without totally overpowering the flavour. 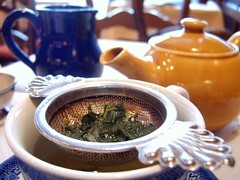 Good green tea is usually not more than slightly bitter, as long as it is drunk while hot, and not brewed too strong. However, green tea bags are usually made with far too much tea, low-grade and broken up, and in my experience almost always make a bitter brew. Brewing temperature is absolutely crucial with green tea, which should never be made with boiling water; scalding the leaves that way not only removes much of their pleasant flavour, but gives them a new acrid flavour, which puts many people off the tea entirely. Many green teas have a flavour dominated by vegetative tones. This might be accompanied by a gentle smokiness, as in gunpowder tea and chun mee; rich, slightly flowery depths, as in pi lo chun (bi luo chun); or a sort of sea-sidey almost-fishiness in the case of most Japanese green teas, which sounds like it would be horrible but is actually oddly pleasant. Oolong tea is tea which has been partially oxidised, placing it between green tea (which is plucked and dried quickly before the leaves can blacken) and black tea (in which the leaves are rolled or cut, and carefully oxidised over the course of several hours before drying). In general, it tends to have richer aromas than any other unflavoured tea, and most varieties are notably much less bitter than any black tea. 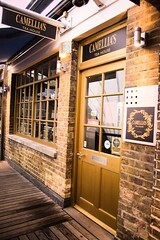 There is enormous variety in the range of oolong flavours, and also extraordinary depth to them. Some are sweet, some flowery, some toasty, some autumnal, some have flavours which the English language is quite at a loss to describe. Good Chinese tea sets designed for oolong sometimes include separate ‘scent cups’, into which the tea is poured before it gets to the tiny drinking cup, just to give the tea drinker an opportunity to savour the aroma more deeply. Like green teas, oolongs can generally be brewed several times, and each brew will often bring out different flavours from the last. Temperature is again important; though oolongs are not so thoroughly ruined by too-hot water, much of their taste will go to waste. White tea is the lightest of all the true teas, made from young leaves plucked while they still have the baby-hairs on them and dried at once to preserve them in almost the same state they came off the bush. They have gentle flavours, never more than a tiny bit bitter when brewed correctly, often with a sweet aroma somewhat reminiscent of honey. Despite the softness of their flavours, there is a depth to them which should be lingered on. 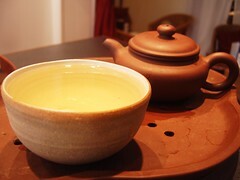 White teas must be brewed with water well below boiling point, and can be steeped repeatedly. Pu-erhs, sometimes described as ‘post-fermented’, are a whole world of tea to themselves, despite being a relatively tiny niche market. Their musty aroma often borders on mouldy, which puts many people off, but they do have a pleasant, earthy richness to their taste which belies their smell. Pu-erh fans tend to be extremely enthusiastic about it, often to the puzzlement of the rest of the world. Pu-erh tastes like it must be good for you, and according to Chinese tradition and some scientific studies, it really is. Some of the best-known of Chinese teas are flavoured, and derive most of their character not from the tea itself but from things added to it. Proper jasmine tea is flavoured by being left with drying jasmine flowers to absorb their flavour; lapsang souchong is smoked, traditionally over pine wood, to obtain its intense, tarry aroma; Earl Grey is scented with oil of bergamot, obtained from a particular kind of orange. Genmaicha, popular in Japan and Korea (where it is called hyun mi nok cha), is made of green tea with roasted rice, and it is the toasty flavour of the rice that dominates its taste. Another toasty tea is hojicha, a rich brown tea made by roasting green tea. It has an unusually savoury taste, with a slightly nutty aroma; although it is not yet well-known in the West, it is generally extremely popular with those who have tried it. It is low in caffeine, and can be drunk hot or cold – for my money, it makes the most refreshing iced tea there is. All photos are by the author except ‘Think in Pictures‘ by munded and ‘Pu-erh tea‘ by shop boy. Links in the text are to further tea writing by the author. Welcome to Fergus Ray Murray‘s new blog. Well, what with this being Teh Internets and all, I thought I had better come up with some kind of a pseudonym. I took the name of my favourite tea because I liked the sound of it, I wrote a song about it once, and it was also the name of the hero of quite a cool computer game I remembered from my youth. I only discovered later that I shared the name with the Internet’s most famous bunny, and the Pigsy character out of Dragonball. Such is life. Oo is an interjection which can express glad surprise, or a moment of pleasure. I like that, and I thought I might enjoy keeping a log of things that make me go ‘oo’. Call me a preposterous optimist, or – if you prefer – a gloom-mongering Lethargian – but I think there’s a fair chance I’ve got another fifty years ahead of me on this planet. Life is far too long to live without routinely taking pleasure in day-to-day things of beauty and wonder. Have a cup of tea?